Falmouth School showcased their fantastic production of Disney’s High School Musical on Stage, with over 40 students involved last week. 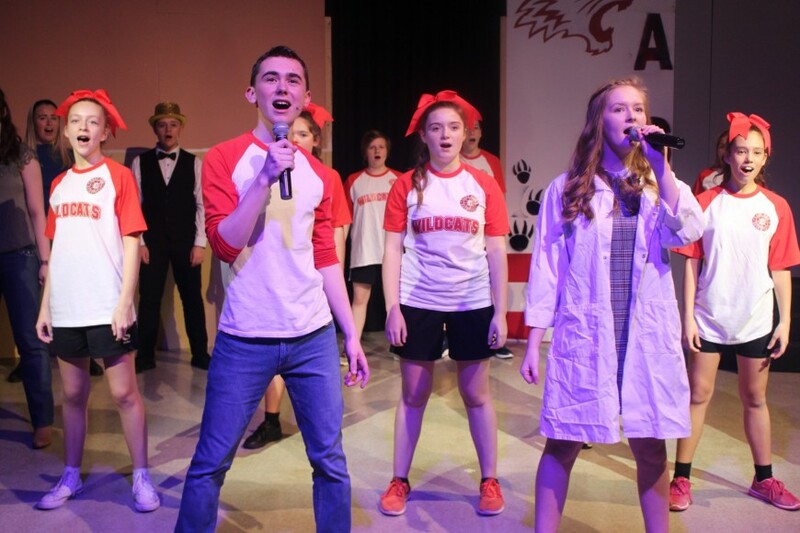 In what was one of the most highly anticipated school productions of recent years, tickets were in high demand as the school hall was sold out for each of the productions three nights and probably could have done so twice over. For the second year in succession, Falmouth School students were accompanied on stage by primary school students from Falmouth MAT schools King Charles and St Francis. The show was a huge hit with the audience, who were great fun too on all three nights, as they laughed, clapped and sang along to the catchy numbers. The performers were given a standing ovation on each of the three nights and there was superb feedback for the undoubted talent that was on display throughout the production. The honour of the lead roles for Troy and Gabriella, were shared expertly by Max Thompson, Callum Kerr (Troy), Kiera Wright and Abbie Burley (Gabriella), channelling their inner American high school teenager with pinpoint accuracy. The audience were given the giggles on more than one occasion, by some excellent performances from Brooke Mitchell (Sharpay), Ben Kitts (Ryan), Hannah McMillan Pardoe (Chad) and Izzy Macpherson (Taylor). The audience were kept up to date throughout by Owen Wakely and Hannah Attree (Jack and Jackie Scott) and there were potential Falmouth School teachers of the future on display, with convincing performances from Reuben Hesser and Aimee Wandless as Coach Bolton and Ms Darbus. There were some spectacularly choreographed dancing scenes from the cheerleaders, who got the show off to a high energy start with the ‘Wildcat Cheer’, an energy and tempo that was maintained throughout, by the ‘Braniacs’, ‘Jocks’ and ‘Skater Dudes’. It was mightily impressive to see such a complex and lengthy performance so tight for such a large group of students, all of whom were on the money on all three nights. The show finished with a superb medley to round things up nicely. Every single member of the cast gave a major input to the show and could be exceptionally proud of their efforts.